Cody was our first miniature donkey and it was love at first sight. He came to us right after he was weaned and quickly made friends in our miniature gelding herd. Cody packs a lot of personality into a tiny little package. He is very expressive, loves shoelaces and is not afraid to snort at the things he doesn’t care for. Cody has been known to melt a few hearts with his big chocolate brown eyes. Come meet him and see for yourself. Chai arrived shortly after Cody and was named after the owner’s favorite tea and because of her beautiful coloring. Chai came to us from North Carolina where she was used with children involved in 4H and for petting zoo parties. Chai has a lot of maternal instincts and though she was similar in age to Cody, and arrived after him, she would frequently comfort him and watch over him like a mother donkey. Tessa is the alpha jennet in the group and is a registered show donkey. She is very regal and affectionate. Tessa came to us from a breeder in Tampa and has a beautiful and distinct spotted coat with smooth hair. Tessa loves affection and when she chooses you, you instantly feel a little more important than you did before. She is very vocal and often brays to remind us that it’s time for more hay. 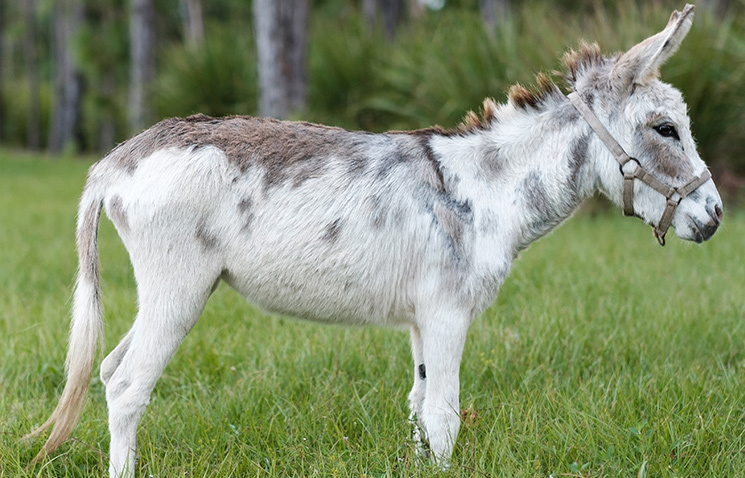 We think miniature donkeys make fantastic pets. They are affectionate (like dogs) and each have very distinct personalities and preferences. Donkeys are thinking and reasoning creatures. This sometimes gives them an undeserved reputation as being stubborn and uncooperative, but that is not true. Due to their thinking nature and strong sense of self preservation, donkeys are not as flight oriented as other equine and are less apt to hurt themselves or others when startled. Donkeys can be more than just pasture pets. They are extremely intelligent and are easily trained. Donkeys can learn to pack, go over obstacles and are great for driving. Miniature donkeys should not be considered for livestock guardian jobs due to their size. Although there is nothing cuter than a baby donkey, we do not breed miniature donkeys and encourage those who would like to have a miniature donkey to consider adopting from a rescue. There are many donkeys in need of a loving home. The average lifespan is 25-35 years, but with proper care and nutrition they may live longer. 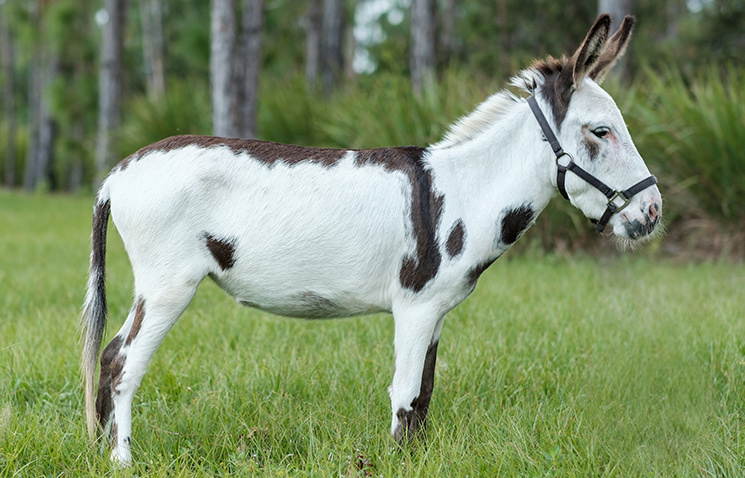 Miniature donkeys are generally 36” and under when fully grown. This is the required height for the registration with the Miniature Donkey Registry. Mature weight for donkeys is between 250-350 pounds. Almost all donkeys will have a cross marking on their back. 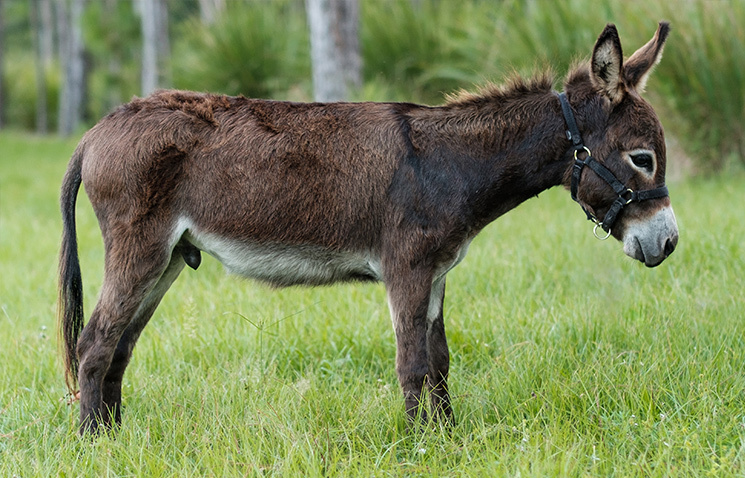 The cross is a darker brown or black dorsal stripe running from the top of the donkey’s back from the withers (where the neck connects to the back) and extending to the rear and down the tail. There is also a shoulder stripe that intersects the dorsal stripe at the withers running down each shoulder. There is a legend called the “Legend of the Donkey’s Cross”. It states that Jesus rewarded the donkey for his loyalty to Him when he carried Jesus into Jerusalem and stayed with Him at the crucifixion by placing the shadow of the cross across the donkeys back for all to remember the importance of God’s humblest of creatures. Donkeys are probably most known for their braying however that is just one way they communicate. Donkeys also communicate vocally with a variety of snorts, grunts, wheezes and wuffles that can vary between individual donkeys. Domestic Jacks and Jennetts bray for food, when separated from their herd, or in answer to another donkey’s bray. Snorting generally shows excitement. Grunts are antagonistic and are generally followed with aggressive body language. Wuffles are more intimate and can be used when inviting another donkey for mutul grooming or are used by a jenny to call her foal. Male donkeys are called Jacks. Female donkeys are called Jennets or Jennies. Fixed male donkeys are called Geldings. Baby donkeys are called Foals. Baby donkeys who are weaned and are under a year old are called weanlings. 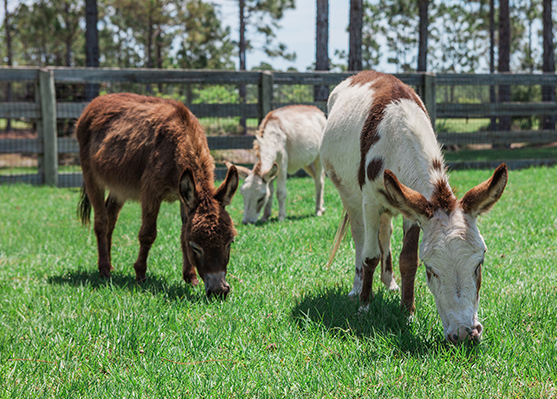 Weaned donkeys between one and two years old are called yearlings.